Opera 51 offline installer is available for download for all Operating Systems. Opera 51 is the latest stable build of Opera. For all Opera versions, you may visit our Opera tag. The browser is your gateway to the world of internet. So you must feel frustrated if you have to go through the wait for your browser to load so that you could start browsing. Opera browser is a popular browser and the latest release Opera 51 is the update come true from your dreams. Opera 51 update is one with immense advantages. It is properly functional improvements that make the browser experience amazing. Waiting forever for the browser to load, is a thing of the past. With Opera 51, all you need to do is simply download it and update your browser and you are in for a breezy experience. There were a lot of speed tests that were done and it was clear that Opera 51 has credible speed improvements. Opera 51 was tested against Firefox Quantum and was found to be 38% better in speed performance (Speedometer 2.0 benchmark used). Having to scroll down is normal and similarly the scroll back up is what is quite a boring thing. To kill your boredom and help you browse more effectively, Opera 51 update enables you to scroll to top with a simple click on the tab. Private browsing for many browsers means that you will have limited browsing features. The Opera 51 upgrade allows an amazing and streamlined experience of browsing even in private mode. When you open a lot of tabs all at once on your browser, you tend to have to click every time to find the right tab. But with the new Opera 51 upgrade all you need to do is open up the collapsible list and you will know what tabs are now open and what were the tabs that you have closed. The earlier versions had a long process of restoration. But the new upgrade allows you to restore the settings in one go, with a few clicks. Previously, when the website required the use of Adobe Flash, they had to ask for permission. The new Opera 51 upgrade allows each website to get access to the adobe flash and thus the sites load much quicker and without glitches and incomplete images. 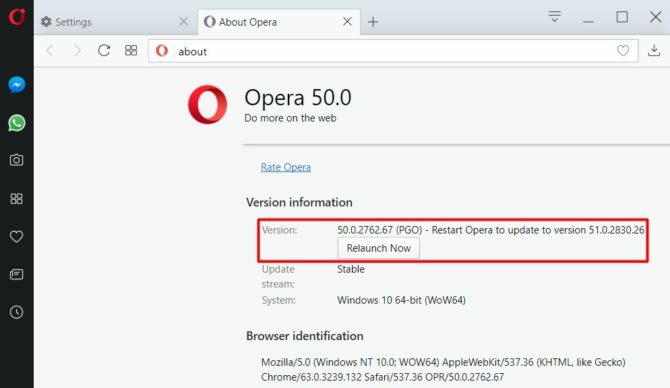 Opera 51 comes with anti-bitcoin mining technology as well as meltdown and spectre vulnerabilities fixes. This makes Opera the first browser to have these security features built-in to the browser. Nice article and analysis provided. worth reading.